The gift bearers bring up the gifts of bread and wine during the Preparation of the Gifts on our behalf. They should assemble at the gift table as the Prayers of the Faithful begin and proceed at the nod of the priest. At the sanctuary the Priest receives the gifts and then they are placed on the altar. If you are celebrating a special occasion, such as a wedding anniversary, you may wish to offer your services as gift bearers during the Mass. 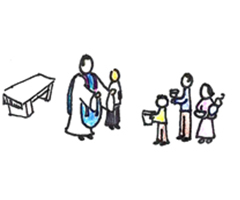 Where the Children's Liturgy of the Word is taking place during a Mass, often the children will fulfil this role when they return to Mass. To participate as a gift bearer see the priest or Mass Coordinator prior to commencement of Mass.